Hello and welcome to February’s monthly update. Hope you have all had the best month possible. 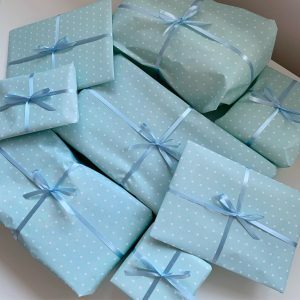 We sent another 12 smile presents to both ME sufferers and carers this month. Our smile presents change all the time as we personalise them with each person’s likes and interests. Some of the items included this month were blankets, fluffy socks, notebooks, mugs, candles, pamper products, colouring books, book vouchers, food hampers and jewellery. Always lovingly wrapped with a bow and posted to nominees to create a smile. We love hearing that your smile present has arrived safely and hopefully made you smile. Your kind messages mean a lot and we love seeing your pictures. Thank you to those who sent them to us. You might have noticed our website looks a little bit different that’s because we have given it an update. We hope you like it. 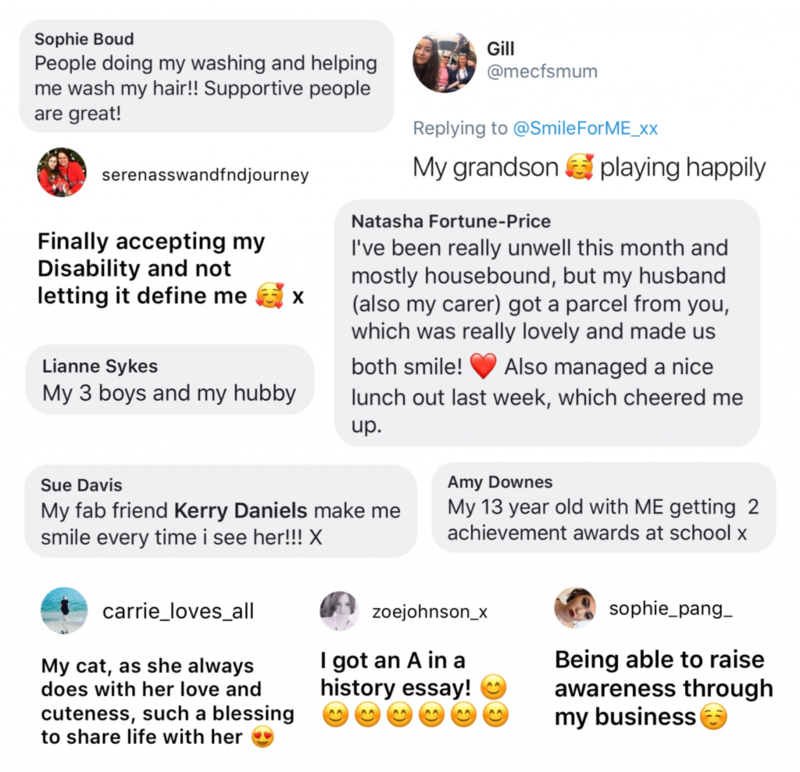 We hope by sharing some of the things that have made you smile it can help others to find a smile too. My personal smile of the month was thanks to a friend who organised an at home afternoon tea for my Mum and I. What made you smile this month? One way to fundraise for us at no extra cost or effort from you is through Easy Fundraising. Many ME sufferer shop online already due to accessibility so why not collect free donations at the same time? Simply follow the steps, sign up and add the easy fundraising link to your bookmark so each time you shop Smile For ME receives money for free. We have already raised over £500 at no extra cost thanks to those who have signed up. A big thank you to everyone who has kindly donated and shown their support to us this month. Thank you Steve, Lucy, Dionne, Pauline and Tracy, your generosity is so appreciated. 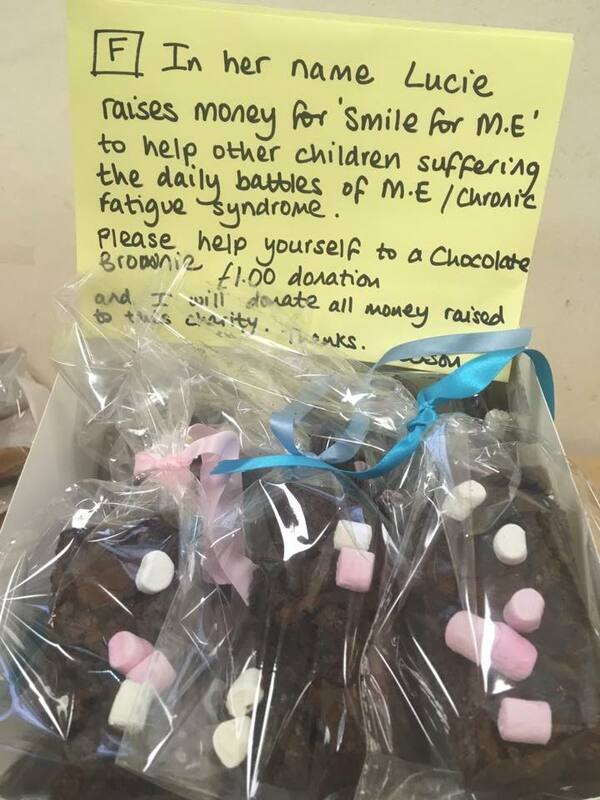 A special thank you to Alison who baked and sold brownies to her colleagues at Specsavers Liverpool Lord Street to raise money for the In her name Lucie fundraiser.